Café Fleuri is known for its Saturday Chocolate Bar (Sept.-June), breakfasts and extensive Sunday brunch. Breakfast Mon.-Sat., Lunch Mon.-Fri., Brunch Sun. 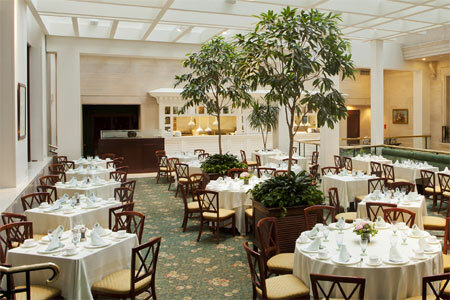 : THE LANGHAM, BOSTON, IS TEMPORARILY CLOSED FOR RENOVATIONS UNTIL SPRING 2020. Café Fleuri is known for its famed Saturday Chocolate Bar, a September through June sweet tooth's extravaganza. Imagine a room filled with every kind of chocolate concoction imaginable --- from cakes and pies to ice cream and fondue. The Sunday jazz brunch is the more adult (and savory) equivalent of the Saturday sweets spectacular. And the rest of the week? The business class holds court over speedy power breakfasts of tenderloin steak and eggs, and lunches like lobster mac ‘n’ cheese and New Bedford sea scallops.